Long Since Dispersed: LOOK WHAT I FOUND! A fantastic discovery! Last Saturday, during a cable outage that made both television football and genealogy impossible (without using up valuable cellular time), it seemed reasonable to attack a little clean-out project - a small bureau full of old electronic equipment (mostly very old cables and power supplies) for recycling. 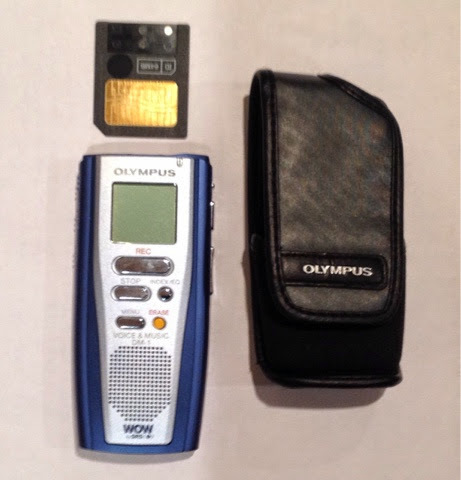 However, in the bureau, I found an eight or nine year old Olympus DTS 10, a small recorder I used to record some work-related training events! With fresh batteries, it worked! And, to my very tearful and grateful surprise, it included a special recording. Exactly six years to the calendar day and day of the week, it was a nine minute interview with my father James A. Wilmes, who died on St. Patrick's Day this year at 92 years and 9 days old. I had simply forgotten that we created this. He was a simple man and there is nothing elegant here. But it was a sweetly emotional gift to hear his voice again. 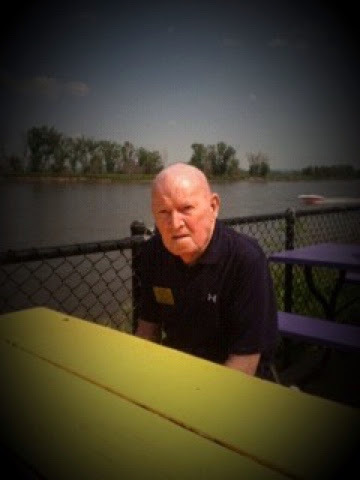 This picture is my father Jim at a fish restaurant north of Omaha riverside on the Missouri about three years ago. The only document we have to prove his birth is a poor copy of a baptismal record from a Council Bluffs, Iowa, Catholic parish with a date of birth in Mercy Hospital there could be an 8 but also might be a 3(rd) day of March, 1922 and somehow Social Security decided to use the latter instead of the 8th. There ensued a long series of encounters with Social Security which finally led to my repeating "He uses March 8, 1922, but Social Security uses March 3, 1922" to all the pharmacists, doctors, insurers, Medicare Part D providers, and others who inquired about that date. There are military forms which use the "correct" date. Someone believed him in 1941 when he enlisted! That Sunday, we sat in his house on North 533rd Street in Omaha, Nebraska, his home of 48 years at the time. It was Thanksgiving weekend, and on the recording there are sounds of cooking in the background, pots clinking and muted conversations. But Dad and I sat at the kitchen table and he answered my questions about what it was like for him during the Depression. He had an amazing memory and enjoyed telling us about his life. Some things he repeated often, but some of these things were really facts I could not remember having heard. So, this was a belated but excellent second chance. NOTE: I label this partial because there is a little story of an unfortunate neighbor lady who was murdered and I did not have time to document her story! Sherry: Tell us what you remember of the hard times around the Depression. You were living on North 35th Street? Jim: 35th and Chicago. when Dad (Henry J. "Hank" Wilmes) had his garage (Farnam Ford), he could do an overhaul ofr $15 for a transmission. This was at 29th and Farnam which is npow the Interstate (I-480). All cars. Fords and idifferent ones. We had a grocery store called Nelson and Nanufsen (sp?) at 43rd and California Streets and when you walked in there they had things along the walls (bins?) and you could get a pound of coffee and sugar in a glass and they had trucks for deliveries. 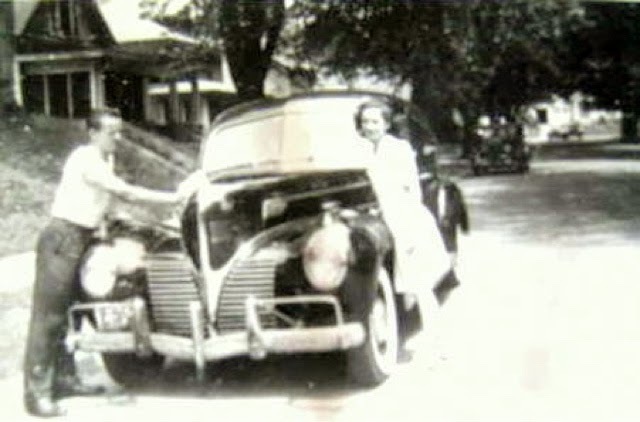 When Dad (Hank) would do work on his cars, he (the owner) traded for groceries instead of money. On Sunday, there was a place (a Chinese or Japanese restaurant?) between 29th and 30th (on Farnam) and he did work on their cars, so about every two weeks we had chicken chowmein (chuckle). You could get a pound of round steak at Wohlner's Grocery for 39 cents if you had 39 cents (and according to Aunt Joanne, Jim's sister), heart, kidneys and liver were thrown in for free)! Sherry: Were you working then? Did you work s a teenager? Jim: In high school. Well, on Saturday morning I worked at a grocery store at 33rd and Cass for $2 from 6 am to 6 pm. At 6 pm, I would go to the Boagards' drugstore (across the street) and work until 11 pm for 20 cents an hour On Sunday, I would go to work from 3 pm to 11 pm on Tuesday and Thursday. Sherry: Did you get paid cash? Jim: I got a check for it, money (cash) once a week. Sherry: Was there anything withheld then, payroll taxes or anything? Jim: No. I quit and I played baseball for one year in high school. Sherry: When you got out of high school, you had a hard time finding a job? Jim: When I got out of high school (St. Cecelia's Cathedral), I had a hard time finding a job for a couple months so I coached baseball at Cathedral. There was a fella named Mack McCormack who was the manager of the National Cash Register (later NCR) office here and so I got a job there on September 22, 1941, because I had graduated (he then worked for NCR for 42 years). After that, on a December Sunday, we were playing football on the grounds at Cathedral School and somebody had an old car there with a radio and they said that Pearl Harbor had been bombed. Sherry: So when you worked at the grocery store, were you bagging groceries and at the drug store, were you making sodas and delivering? Jim: At the drug store, I was delivering prescriptions and I was a soda jerk. I could make the best sodas! Vanilla, raspberry, strawberry. We made small cokes for 5 cents. Cherry, Whatever you wanted. I delivered on a bicycle. The longest trip I ever had to make was 50th and Underwood (two large hills in that trip). Sherry: Who were the customers for the drug store? Jim: Oh all kinds of people who would come in for ice cream sodas, malts and sundaes, strawberry, chocolate. Sherry: Did the streetcars stop there from downtown Omaha? Jim: Yes, then it would turn north and go to North 33rd and Parker. Sherry: Did you listen to the radio and the Roosevelt Fireside speeches? Jim: Yes the speeches. When I would come home from school, I would turn on KFAB and they would have the best music you ever heard (Big Band Era hits). And I used to listen to that. 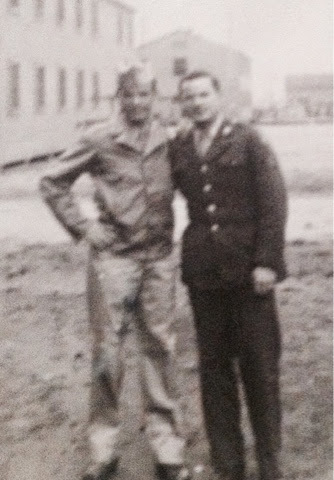 Jim: When I enlisted (August 27, 1942), I went to Ft. Crook (Bellevue, NE) and then the same day took a train to Ft. Leavenworth (Kansas) that night, getting in at 2 am. Some guys had to stay up and do fire patrol. We got up at 6 am and had breakfast and then got all our new outfits (uniforms), the outfits that we would have for three and a half years. You could send your civilian clothes home if you wanted to. Before we left Ft. Crook, they called our folks and told them to come out and bring your necessities. So, imagine high school freshmen, sophomores and juniors working 19 hours a day Saturdays and then five hours a day on Sunday and twice weeknights from 6 pm to 11 pm! And, he did it cheerfully and without complaint 75 years later. Today, of course, most grocery stores don't feature wooden bins for produce; except in major cities, grocery deliveries are not made by bicycle, if at all; and there are probably not many pharmacies that include soda fountains. I have no photos here in Brooklyn of my father at that age, but in his Omaha house there are several photo albums of many later events as he was a good collector. Using these "copies of copies" photos of his sisters, Marjorie and Joanne, I can share my handsome father's world with you. 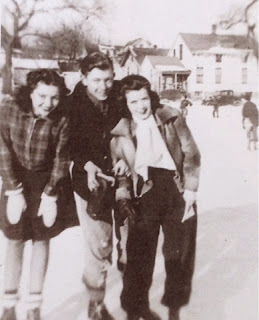 The first is a picture of his sisters (left to right) Joanne and Marjorie with a neighborhood friend ice skating in Gifford Park in 1939 behind their home. There is an image in the distance of a car my grandfather Hank might have repaired (perhaps a 1939 Model A Ford like the one he maintained for years, so long that I rode in it as late as approximately 1950-1953). 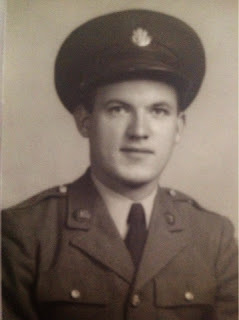 Here is an early photo of Dad in his Army Air Corps uniform, probably early 1943. 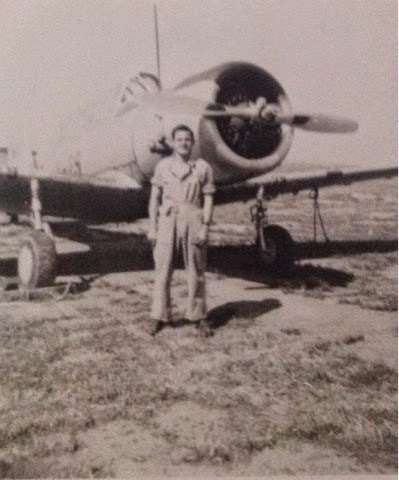 This photo is from the flightline checking fighter training plane radios at Minter Field, Bakersfield, CA. A later picture of Dad and Aunt Joanne polishing Hank's car on No. 35th St. while on leave. At a Los Angeles area military base with his brother John Henry "Jack" Wilmes late in WWII. 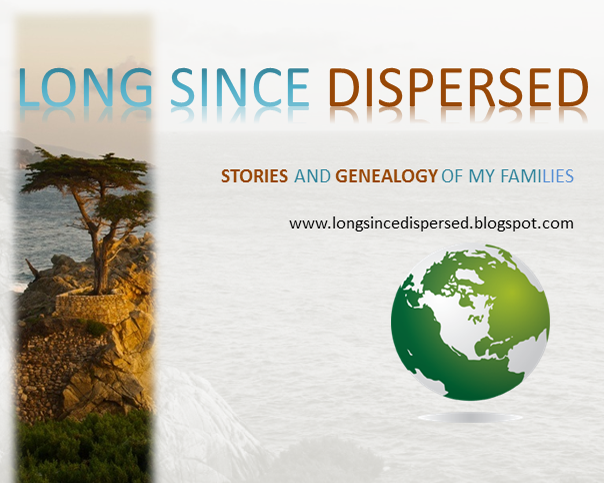 So, what is next for my genealogy searches? First, finish learning the new software to add audio and video files. And beyond that, Nebraska and Iowa genealogy makes searching for extended family tough. Their documents are rarely digitized, though I understand there are very limited records at the Nebraska Historical Society in Lincoln, NE. Even the Ancestry.com state records wiki page acknowledges that courthouse by courthouse searches are necessary but records are good quality. District Court clerks are busy and there are no online ordering systems. Newspaper archives have not been digitized. Future searches will require library, courthouse and newspaper company office trips. This brief recording was a discovery to be treasured and preserved. It generated a busy week searching for strategies for conversion software for audio and photos; retrieving scattered photos; consulting non-traditional sources (such as Omaha's Cathedral High School Alumni Directory 1991, published by Bernard C. Harris Publishing Copany, Inc. White Plains, NY 1990,one of Dad's prized possessions); visiting by phone with Aunt Joanne in Omaha to confirm some details; and, sharing it all with my two sisters. I could add many more documents, photos and stories and use an updated digital format but the Share A Memory deadline looms today and I would like to share this memory of Dad. I appreciate the opportunity to do that. And I appreciate my reliable little Olympus DTS 10, ancient though it may be. Copyright Mary Sharon Wilmes 2015. All rights reserved. Simple theme. Powered by Blogger.